SOLANA BEACH — Having previously agreed it would be better to demolish and rebuild rather than renovate the nearly 75-year-old lifeguard station at Fletcher Cove, council members at the Oct. 11 meeting unanimously authorized the release of a request for qualifications and proposals. The existing 1,480- square-foot structure built around 1943 doesn’t meet current lifeguard needs and the list of features that don’t meet Americans with Disabilities Act requirements “is extensive,” the staff report states. The perimeter foundation is deteriorating, a second floor captain’s office is accessible only by climbing a ladder and the break room and first aid station are shared. Last year Stephen Dalton Architects conducted a needs assessment and feasibility study to determine whether the building should be renovated or replaced. The results, presented at a June 2017 meeting, indicate nearly all the components are degraded and past their useful and expected life. After consulting with lifeguards to evaluate their needs, it was determined the new marine safety center should be between 3,700 and 4,800 square feet. Presented with three options, council members agreed raze-and-rebuild was the best alternative. But they had concerns about the proposed size. At an estimated 4,770 square feet and $4 million price tag, it was the largest and most expensive option to serve Solana Beach’s 1.7 miles of beach. 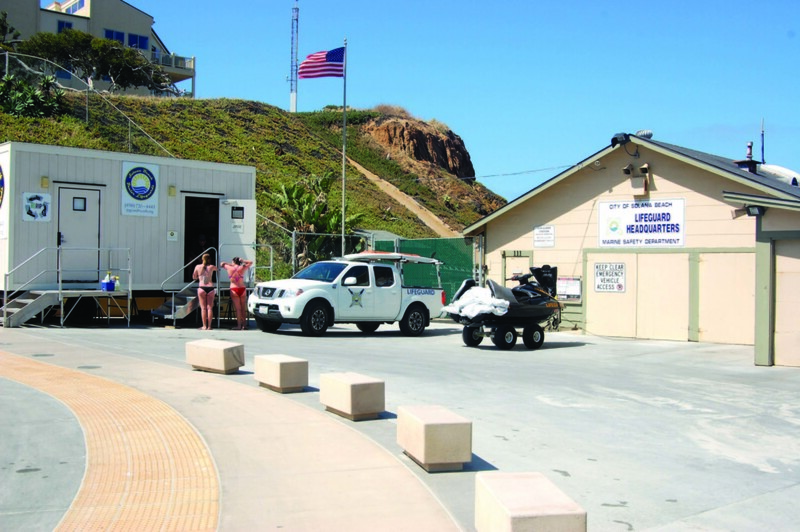 By comparison, Del Mar has 2.5 miles of beach and an approximately 2,800-square-foot marine safety center. The 3.5 miles of sand at Moonlight Beach in Encinitas are served by a 3,250-square-foot facility. The scope of work will include preliminary design drawings, cost estimates and landscaping, grading and drainage plans. The request for qualifications and proposals will also limit the size to no more than 4,000 square feet, or about 16 percent smaller than the maximum size proposed in June. Councilwoman Ginger Marshall said that still may be too big for the site. “Personally, I think 4,000 square feet is huge,” she said. “I mean, they’re doing a great job with 1,500 square feet. “And there are things stored outside that probably shouldn’t be,” he added. Adding to the proposed square footage is a storage garage for items such as personal water craft and inflatable rescue boats. Lt. Jason Shook said some of those are currently kept inside so accessibility is an issue because they are on the second level. Shook said the department had to get rid of one boat that was stored outside because the elements were ruining it. Given the estimated high cost and emotional attachment some residents may have to the building, council members said community support for the project could be mixed. “There’s going to have to be some convincing sales work of the community to redo this building or fundraising or any of those alternate kinds of activities,” Councilwoman Judy Hegenauer said. “I would like to see an open house at the marine safety building where everybody has to climb the ladder to see … what these folks have been contending with so that they will be convinced that yes, we do need a new marine safety center,” she added. Once a consultant is hired it is estimated the preliminary work will cost $125,000, which is included in the budget but not funded. City Manager Greg Wade said council allocated $400,000 from last year’s surplus for unidentified capital improvement projects. “In staff’s mind we have several projects, this being among them, that potentially could be allocated funding from that CIP,” Wade said. Once the preliminary design is completed and permits are obtained, staff estimates it will cost an additional $450,000 for environmental studies and final plans. Workshops will be held so the community can provide design input. Council members will have the final say at each step as the project moves forward.